"Love their whole wheat bread!" "Best bread ever made!! Been eating it since I was a kid." Megan Roosevelt is a Registered Dietitian Nutritionist and founder of Healthy Grocery Girl®, a wellness website & video production company. Megan is also the host & producer for the #1 Family Friendly Dietitian Channel on YouTube with over a million total views. Her realistic, fun & genuine approach to healthy living has cultivated a loyal online following & community. She is an internationally published author, host, producer, as well as a nutrition expert for television and magazines. 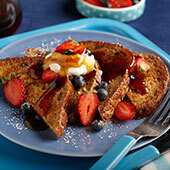 Megan lives in sunny Los Angeles, California with her husband & business partner, Aaron Roosevelt. Why we love Megan at Alvarado Street Bakery? Just like Megan, we believe passionately that healthy organic food can be delicious and cater to all tastes and individual nutritional needs. Our mission has always been to bake the best organic breads, buns, squares, and other bread products with no genetically modified ingredients. 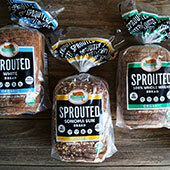 Megan is a fan of all of our sprouted breads and we, at Alvarado Street Bakery, are fans of hers. In June of 2016, a new monthly video series featuring Alvarado products in delicious recipes started on the Healthy Grocery Girl show. We feel blessed to be able to collaborate with Megan and look forward to a long friendship with her and her team. 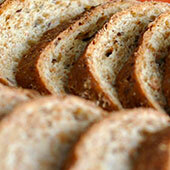 Learn about our newest products, the latest news about our bakery, and more! 2225 S. McDowell Blvd. Ext.